All the Junior League matches for this season have now been completed. Exeter City Dream Team, Jack Hannaford and Sebastian Burrows, held onto their slender lead and won by 23 points to 22 over runners up West Exe Pilots, Lara Gimbuta, Marcus Lee, Ollie Gould and Ollie Gage. Lara and Marcus both remained unbeaten. Three of the five Junior League sessions have been played and Exeter City Dream Team are currently still one point ahead of West Exe Pilots. Our juniors were very successful at the recent South West qualifying event of the Inter Regional Championships, held in Eggbuckland near Plymouth. Lara Gimbuta was unbeaten in the Under 11 girls event and is now ranked Number Four in England for her age group. Lara is therefore eligible for the National Championships in Sheffield in May. Marcus Lee came third in the Under 11 boys and has qualified for the Inter Regional Finals in Kettering later in March. Lauren Loosemore was fourth in the Under 11 girls event. West Exe Pilots (Lara Gimbuta and Marcus Lee) won the first half of the Junior League. Three of the five second half sessions have now been completed and the current table is extremely close with Exeter City Dream Team (Sebastian Burrows and Jack Hannaford) ahead of West Exe Pilots by just one point. All the juniors are improving and enjoying the competition and we are grateful for the continued support from Exeter City Football Club and the volunteers. 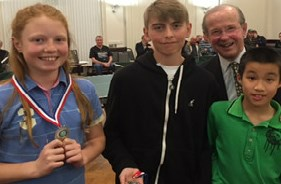 The Exeter Junior Table Tennis League has had another successful first half of the season with about 20 youngsters aged between 9 and 16 all competing enthusiastically. Eight teams have played some hard fought matches on four tables on Tuesday evenings, with volunteers from our main league helping out with the scoring. The fifth and final session is due to take place next Tuesday, 17th November at ECFC at 18 15, and will include the Final between West Exe Pilots (Lara Gimbuta and Marcus Lee) and Exeter City Dream Team (Sebastian Burrows and Jack Hannaford). Both teams remain unbeaten to date. During this final session St Luke's Primary School and Newton Marvels will also be playing off for third and fourth place. It is hoped that further matches can be arranged during the New Year.